For the better part of the last 12 months, we have been working diligently behind the scenes to add a completely revised email marketing system and contact database to HubSpot's core product. Today, we're happy to announce that it has arrived. For the past six years, the HubSpot community has been preaching the gospel of inbound marketing. We saw a fundamental shift in the way that consumers found and evaluated products and services. Pushing out messages through traditional channels had stopped working and successful business had to get found by their customers. HubSpot's original mission was to build a killer online marketing system that empowered our customers to get found online and generate inbound leads. 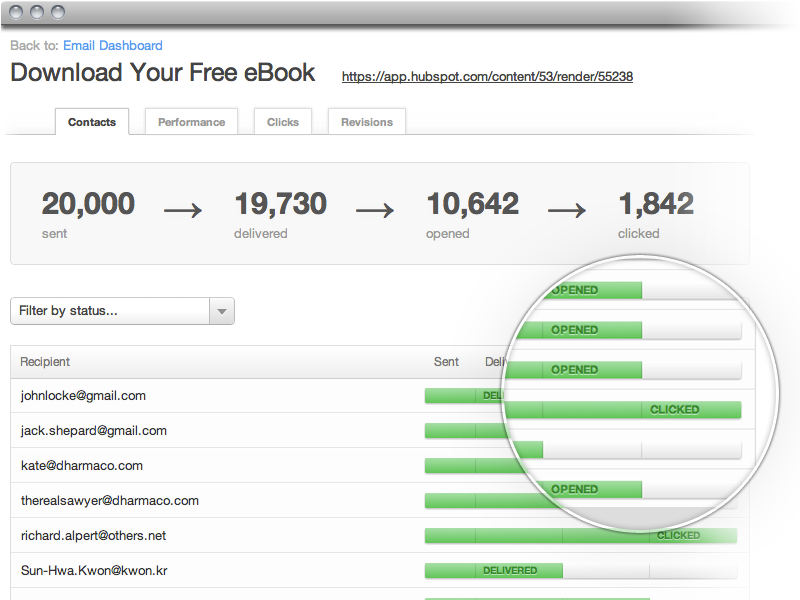 In 2011, HubSpot customers generated over 34,000 leads per day using our software. Over time, our customers have started asking, "what the heck are we are we supposed to do with all these leads?" This is good problem to have. As a response, almost three years ago, we built email marketing and lead nurturing into HubSpot Software. Last June, we took the next step by acquiring a like-minded company called Performable, and adding marketing automation to our enterprise product. When the dust settled, we evaluated HubSpot's email marketing capabilities, and decided it was time to start fresh. Today, we'd like to show you what's new (we think you'll like it). As a marketer, your contact database is everything. Your email subscribers, your leads, your customers, this is the community you market to. For too many marketers this information is stored in separate databases. This means, in order to get anything done, you need to export, import, manipulate in Excel, and lose sleep because you know that you're probably losing leads, or worse, sending someone the wrong message. 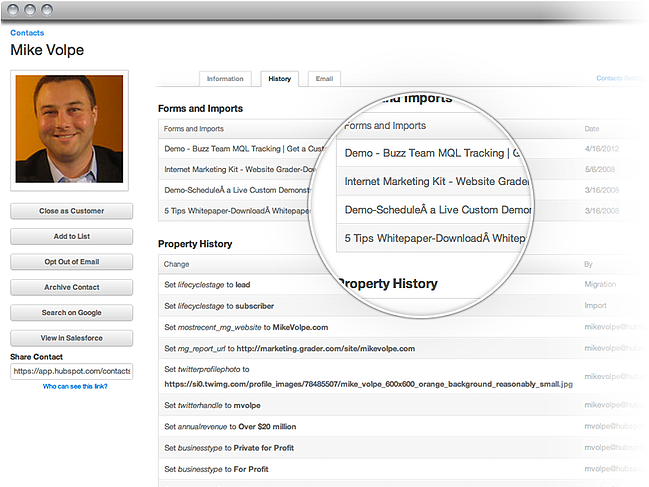 HubSpot's new contacts database lets you keep all your leads in the same place and integrate with your CRM and existing systems. Because you're using HubSpot, you can also track your contacts' online browsing history, email history, form submissions, and social media information all as part of the same beautiful profile. The power of having a centralized marketing database lies in marketers' ability to segment their contacts and create targeted lists. 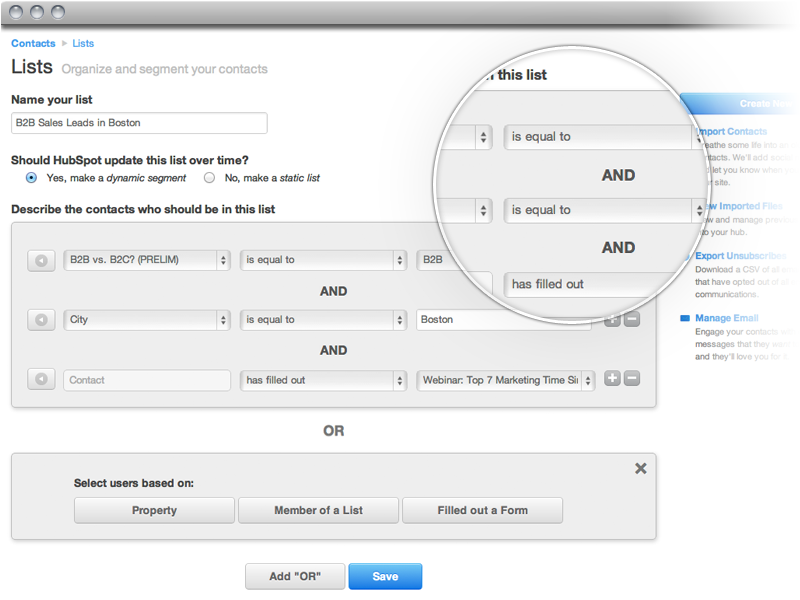 HubSpot now lets you create static and dynamic lists (which automatically update) based on any contact field, previous list membership and form submission. This gives our customers the ability to create extremely focused lists for email marketing, which means your emails can be more personal and create more value for your audience. 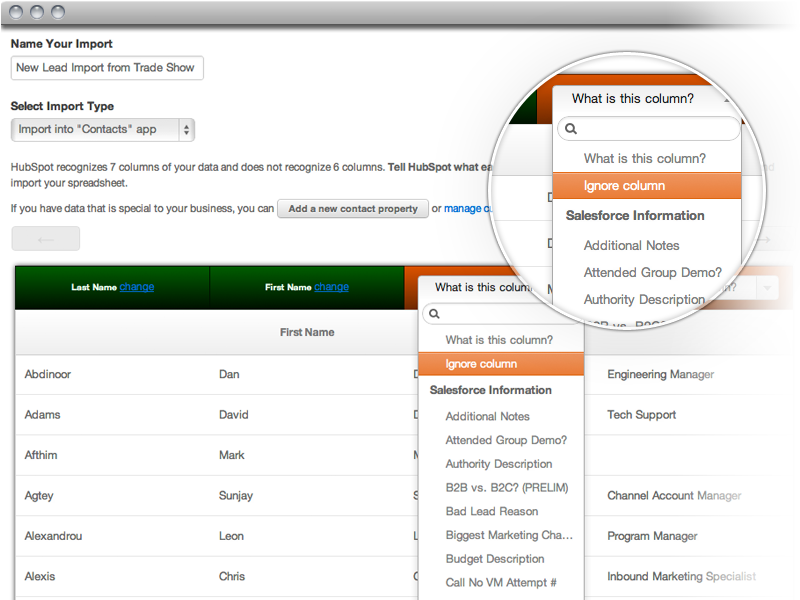 HubSpot makes it easy to import your exisitng database(s), along with all your custom fields. If you're developer-minded, you can also sync your marketing database with an external system or CRM through our robust API. Crafting email marketing campaigns can be a pain. You need to check your lists, make sure they're up-to-date, import new subscribers, create your segment, build a template, craft your message, test your send, select your senders and supression list, and schedule your email. To make this worse, most email marketing providers make you walk through a series of steps separated by screens. By the time you're done, you feel like you need to go back to the begining to check your work. We feel your pain. That's why we worked our developers' fingers to the bone perfecting the experience of building, targeting and scheduling email. It may actually make the task of sending an email campaign enjoyable. Adding personalization to your email helps increase opens and clicks by creating a better experience for your recipients. Nobody likes feeling that they're being marketed to. 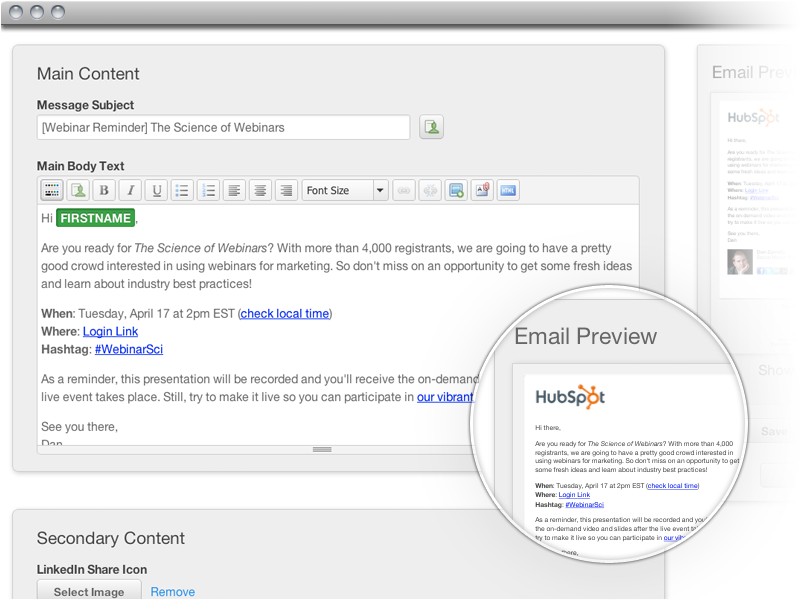 HubSpot lets you customize your email body, subject line, and sender with any custom field from your marketing database. If you're connected to Salesforce.com, you can also use any field from your a lead or contact record, including the lead owner. HubSpot's new email system has both big picture and contact-level analytics so you can track overall opens and clicks and then drill down and to see the actions of each individual contact. And because HubSpot's email and contacts database are both part of the same all-in-one system, it's easy to create a new list based on the outcomes from a previous email send. Emails should look good in Outlook, Gmail, on an iPhone or even a Blackberry. That's why we've created out-of-the-box, best-practice templates that are easy to customize with your company logo and colors. We also made sure that HubSpot's new email system was designer friendly. 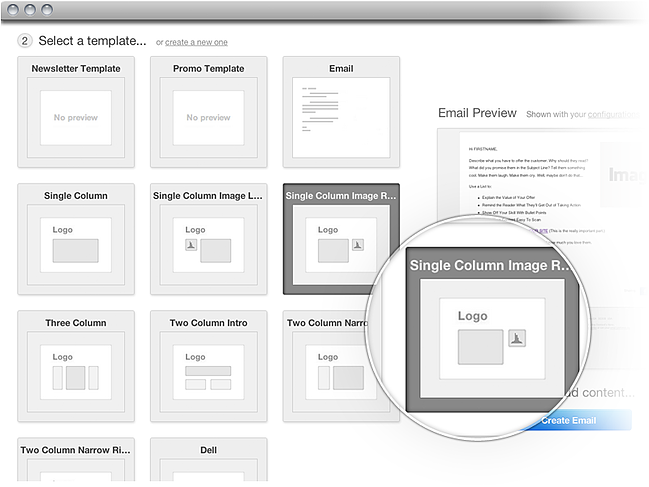 You can now create customizable templates complete with editable areas, widgets, and tokens. 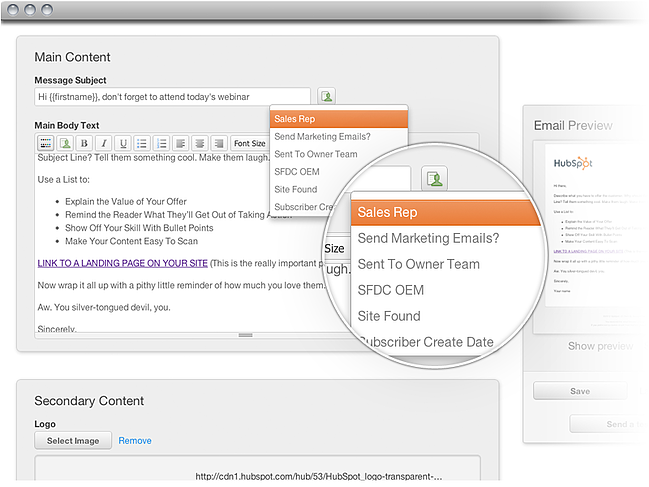 Beyond just email marketing, HubSpot software gives marketers the tools they need to get found, generate leads and close deals. This includes search engine optimization, blogging and social media, lead generation, lead management, email, marketing automation, and analytics. HubSpot is the world's only end-to-end marketing platform. If you are intersted in trying out our new email tools, or seeing what else HubSpot has to offer, we'd love for you to start a free trial today and take us for a spin.